I am about to finish my trip to Italy. As usual, these vacancies give you some new impressions and hopefully new conclusions. I closed my day with a visit to a restaurant deep in the suburbs of Torino. The restaurant is called “Manhattan Pub” and if you will be in Torino once, I can only recommend going there (Via Giachino 46). 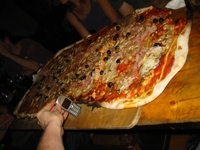 I just participated in the biggest and one of the best-tasting Pizzas I ever had. The pizza for six people covered the table completely and delivered on my dreams without compromise. My italian friends fetched me at the ground station of the mountain railway to Superga. What followed was a high-speed drive through the streets of Torino. Seems as if everybody feels like driving a Ferrari all the time. So Italy is also delivering: be prepared to discover the stereotypic behaviour that you probably have in your mind when you think about this very special place in Europe. Meanwhile, the back-seat passengers where busy exchanging Amore. There are some things where Italy really excels. One is food, the second is the devotion to discussion (the use of mobile phones is beyond what I expected) and the third is the warmth that people use when communicating with each other. No comparison to what I am used to in Germany. Especially when you relate to the computer scene. The hackers here seem to be much more integrated and “normal”. Of course, there is nerdy behaviour, but it is either taking less precedence or there is simply not the same amount of necessity in developing it as in Germany where the nerds seem to be much more distuinguished than the scene over here. But it is just a first impression and I may be also completely wrong. Take it as just one more reality to choose from in your daily life.